This is the 4th installment about what life is like when Breaky is out of the country for an event. TL:DR the first two deal with some silly things, one post negative and the other positive, about what life is like at home when Breaky is gone. The third one dealt with what it was like while I was pregnant. News flash, things were harder while I was pregnant. And then came the baby. BabyCPK is the best thing that has ever happened to us, don't get me wrong. But people are not exaggerating when they say that babies are hard work. Just imagine a mini-dictator telling you exactly what you can and cannot do. Just without actual words, but screams and grunts. Need to go potty? Not if the little one needs to be fed RIGHT NOW. Want to go to the grocery store? HA. You'd better hope Amazon has it, because your phone is the closest thing you'll get to the store in the next 12 hours. Oh, and stock up on body spray, because you are very lucky if you get the minutes you need to shower. While all that seems daunting, if you have a partner, it is manageable. One can do the dishes while the other rocks the baby. The other can shower while the other changes her. So when Breaky said he was going to be gone for TWO WEEKS, not going to lie, kinda didn't want him to go. We are lucky in that we have an amazing Nanny who is watching BabyCPK while I'm at work. But when I get home, man, I really miss Breaky. Speaking of dogs, poor DogCPK has gotten very little exercise this past week. Really hard to do juggle a stroller AND a dog who loves to pull and bark at other dogs. Luckily we have amazing friends who are going to bring DogCPK on a doggy outing with their dog. In one of my other posts about this, I had mentioned that strange noises were louder and more scary when I was alone. Now that I am responsible for a little life? Terrifying. Let me tell you, having the broom fall in the broom closet sounds like someone is breaking down the door. One pretty cool thing is that I propped up my phone while Breaky was casting to help with BabyCPK's tummy time. Figuring it would give her something to look at and hear her Daddy's voice. 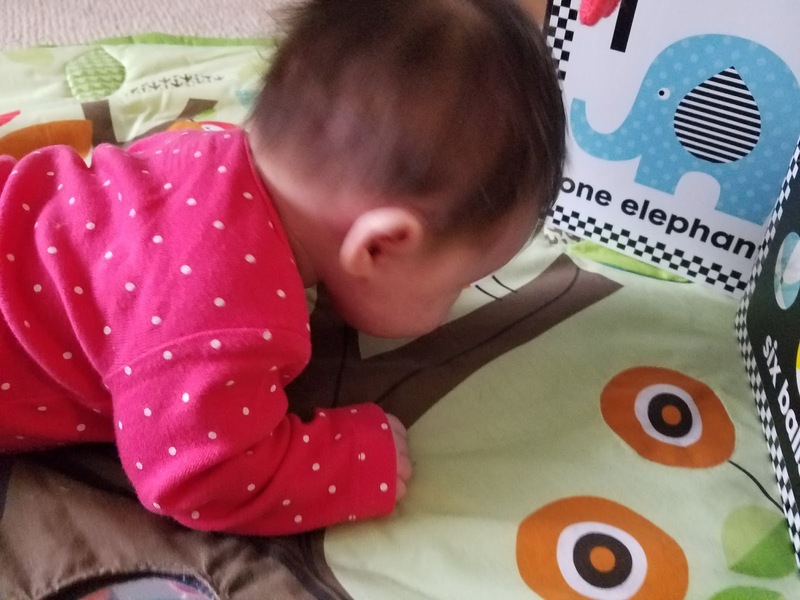 Tummy time! I didn't get a picture of her listening to Breaky. It would be nice to be able to make a full meal again, and not whip together what ever I can while carrying a baby that refuses to be put down. Pro tip? Burritos are easy to eat one-handed, just make sure you do not drip any on your baby. All of us that are home are missing Breaky something fierce. We are insanely proud of him as he is casting the Epicenter XL Major in Russia. I also realize how hard it must be for him to be away, especially since the little one just turned 2 months old this past weekend.